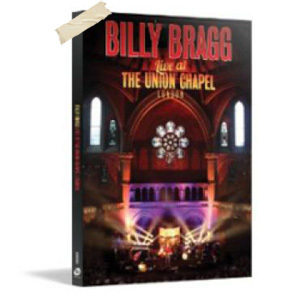 The track listing for both the DVD and CD that are included in this package is the same but sadly the CD fades out the applause in between songs and totally misses Billy’s introductions and chatter; which is actually the highlight of any Billy Bragg concert. As a ‘for instance’ All You Fascists are Bound to Lose is a fine song and evoked happy memories of my younger more radical days when I heard it on the CD but Billy’s two minute introduction about ultra-Religion that leads up to it on the video had me punching the air in solidarity with Brother Bill; which I did all those years ago. This is instantly followed by his interpretation of Woody Guthrie’s I Ain’t Got No Homewhich Billy explains was written 70 years previously but is still relevant today; making the song itself a real tear-jerker as he goes for the jugular with his pathos sodden delivery. Young Mr. Bragg is typically self-depreciating several times; particularly about his beard and new found Americana dress sense and during the short interviews that intersperse the songs he is actually quite humble at times; but the fire is still burning brightly in his belly which is acutely evident on Never Buy the Sun; which is a song I’d totally forgot about but the sentiment and biting lyrics about the hypocrisy surrounding Britain’s best-selling newspaper reminded me what a great poet he is and always has been. The most interesting introduction was the one that leads up to Between the Wars and then There is a Power in a Union,because it is about him hearing about the death of the singers nemesis; ex-Prime Minister Margaret Thatcher which is humorous, thought provoking and not quite I or most people would have expected; but eloquent beyond belief; then the songs then sound like timeless Folk songs on the DVD; but lose much of the drama on the CD, which is a shame. To some degree the concert peaks at this stage, but the stories and songs come thick and fast making the time fly by, with new and old songs all sounding timeless in this context. The concert and CD ends with a passionate and quite rowdy Waiting For the Great Leap Forwards which would have had the now Middle-Aged Punks leaping about 20 years ago; but in this auspicious church setting they smiled a lot and applauded loudly at the end. Modern technology comes into its own at this stage with a vast array of ‘bonus extras’ added to the DVD, starting with Bragg dusting off his debut recording Life’s a Riot (With Spy vs Spy) for a 30th Anniversary reworking and we also get a couple of song videos (including a very funny ‘making of’ Handyman Blues), some songs recorded at the intimate Lexington Pub and just before another light-hearted interview there is solo rendition (with 5,000 people bellowing out the chorus) of New England recorded at Wembley; and I couldn’t think of a better way to end the evening. As a long-time fan of Billy Bragg I found myself smiling, getting misty eyed and even punching the air in solidarity at various times during the concert DVD and it was only after hearing some of the newer songs set against the earlier ‘hits’ that they can be put into perspective and go to prove that the Bard of Barking is actually still writing songs like Do Unto Others that are just as thought provoking as his 30 year old working class anthems.